progwolff requested review of D12925: Parse global config files. Remove 'Vendor default' option. Fix changes not recognized..
progwolff added a comment to D12925: Parse global config files. Remove 'Vendor default' option. Fix changes not recognized.. I installed a fresh Neon (dev unstable), removed the preinstalled files from /etc/fonts, copied your files to /etc/fonts and applied this patch. Still cannot reproduce your issue. I still cannot reproduce your issue. Any idea what I could try? progwolff added a comment to T7927: Fonts “easy mode”. progwolff planned changes to D12925: Parse global config files. Remove 'Vendor default' option. Fix changes not recognized..
With this latest version, the issue I mentioned earlier persists for me. I did briefly get sub-pixel rendering again to work by switching the hinting style to Full, but then after switching back to something else and then back to Full again, it no longer worked and I was back to no sub-pixel rendering again. Feels kinda buggy. 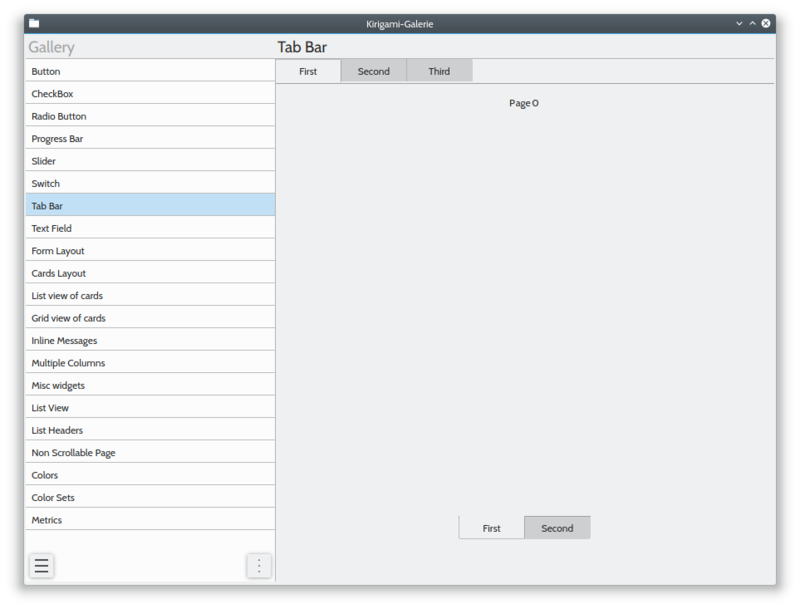 Either way, we first need to implement tabs with a decent look&feel in Kirigami (resolve bugs 394295 and 394296) . progwolff updated the diff for D12925: Parse global config files. Remove 'Vendor default' option. Fix changes not recognized.. So we keep the separator line in the advanced mode and drop the tabs from D12849#263660 ? We already discussed in D12849 if we should split the current layout into two tabs. I like the idea of a simple mode and using tabs here seems like a good idea. But we might want to have three tabs (Simple, Fonts fine-tuning, Rendering fine-tuning). could you give me all those files? I am not sure about the case when neither global nor local configs exist for subpixel or hint. On my system it seems like rgb subpixel rendering with slight hinting is used when no configs exist. But I cannot find any documentation on this. progwolff committed R119:b0c9b776be37: Merge remote-tracking branch 'origin/Plasma/5.13' (authored by progwolff). progwolff committed R119:79a4bbc36cee: Don't unintentionally change font rendering when rendering preview images (authored by progwolff). progwolff closed D14480: Don't unintentionally change font rendering when rendering preview images. progwolff removed a reviewer for D12925: Parse global config files. Remove 'Vendor default' option. Fix changes not recognized. : rkflx. progwolff added a dependency for D12925: Parse global config files. Remove 'Vendor default' option. Fix changes not recognized. : D14480: Don't unintentionally change font rendering when rendering preview images. progwolff added a dependent revision for D14480: Don't unintentionally change font rendering when rendering preview images: D12925: Parse global config files. Remove 'Vendor default' option. Fix changes not recognized..
progwolff requested review of D14480: Don't unintentionally change font rendering when rendering preview images. Big sorry for being away for so long. I had some things to do that took much more time than initally planned. Rebase on master. Partial rewrite. progwolff planned changes to D13579: apply blur to windows using Konsole as KPart. progwolff requested review of D13579: apply blur to windows using Konsole as KPart. progwolff added a comment to D12851: Change preview text background color to match with default combobox background color. I planned to land this together with D12849 and D12925. 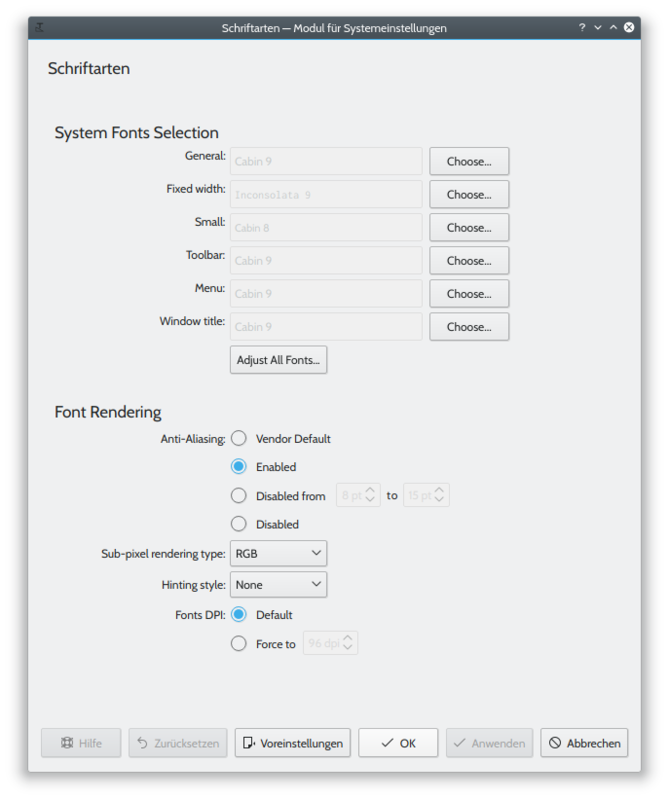 progwolff accepted D13051: Fix Font KCM force font DPI checkbox. 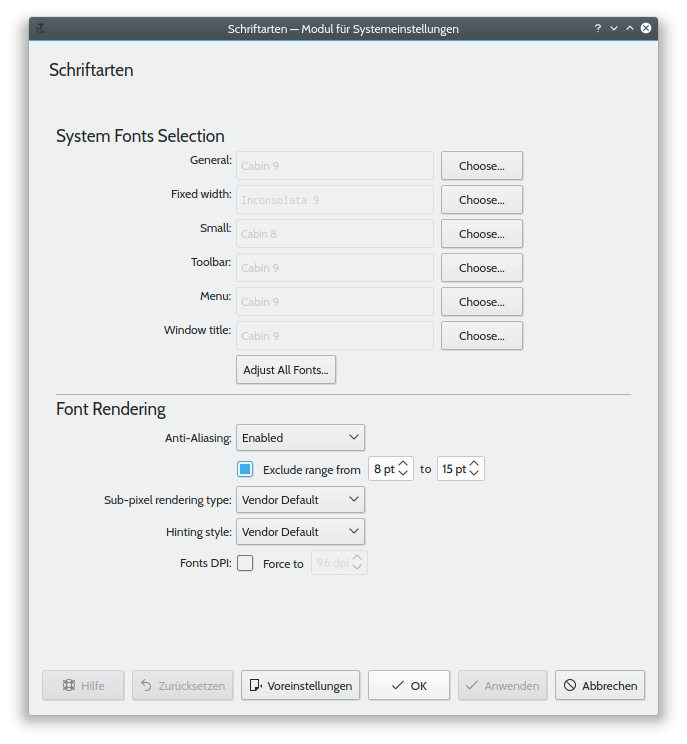 progwolff planned changes to D12849: Improve layout of fonts kcm. I'll resume testing once this works a bit better. I'd say let's not rush this, and get it right for 5.14.
progwolff updated the diff for D12849: Improve layout of fonts kcm. 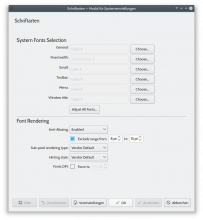 progwolff added a comment to D12849: Improve layout of fonts kcm. share/kpackage/kcms/kcm_fonts/contents/ui/main.qml:273:17: QML SpinBox: Binding loop detected for property "value"
The first isn't critical and exists since the previews were introduced. I will try to fix this in a separate commit. if it removes the vendor default option, how can i ask to not touch the global/local defaults in any way? We were always told by VDG that tabs are bad and a 5 km vertically scrolling list is better no matter what. So be consistent, please. 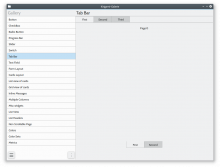 From what I could find there is no TabView in QtQuickControls2 or Kirigami. @progwolff, what happened to the frame for the tabbed view? Did it the wrong way. Is fixed now. Use radio buttons. Use spacing instead of Separator. Simplify max(...). BTW, what's the difference between Vendor Default and the regular Defaults button? Either we provide an option to reset to the default for every single option separately, or for none at all. Here "Vendor Default" means that no value is written to the user's ~/.config/fontconfig/fonts.conf. There might be a system wide config file though that has different settings. But the same argument holds basically for any system-wide default setting? The only difference here is that normally defaults are provided via KConfigXT, while here it comes from fontconfig. Could we simply read the vendor default value, display it in the UI and finally if the user's choice is different, write it to the user's config? How about joining the options instead? We might want to take the opportunity to also center-align the titles, which it better-looking for these centered formlayout style UIs. Section titles in form layouts are left-aligned. This would have to be changed in Kirigami. @mart, am I right? progwolff updated the test plan for D12851: Change preview text background color to match with default combobox background color. progwolff requested review of D12851: Change preview text background color to match with default combobox background color. 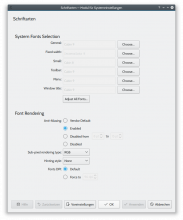 progwolff updated the test plan for D12849: Improve layout of fonts kcm. progwolff requested review of D12849: Improve layout of fonts kcm. progwolff abandoned D12220: [RFC] Beautify declaration navigation context by parsing doxygen commands. progwolff added a comment to D12220: [RFC] Beautify declaration navigation context by parsing doxygen commands. I'm very unsure about this. On one hand, this obviously looks better in your screenshots. On the other hand, what if we encounter comments that are formatted with some other syntax? Do you have examples for comments in a different syntax? I only know javadoc, which is quite similar. Maybe there is a way to add the proposed functionality to the clang backend instead. This way we could be sure that the comments we parse are always doxygen comments. progwolff updated the diff for D12220: [RFC] Beautify declaration navigation context by parsing doxygen commands. progwolff added inline comments to D12220: [RFC] Beautify declaration navigation context by parsing doxygen commands. This is great! Could you add \ref, \link and \endlink as well? progwolff updated the summary of D12220: [RFC] Beautify declaration navigation context by parsing doxygen commands. progwolff updated the test plan for D12220: [RFC] Beautify declaration navigation context by parsing doxygen commands. progwolff requested review of D12220: [RFC] Beautify declaration navigation context by parsing doxygen commands. progwolff committed R169:6ac4e62002ae: checkable FormLayout items (authored by progwolff). progwolff closed D11289: checkable FormLayout items. progwolff accepted D11768: Add Desktop and Downloads to the default list of Places. progwolff added a comment to D11768: Add Desktop and Downloads to the default list of Places. Are you sure? It might be created by some weird startup script or something else. Also, a user can choose to change the location of the Desktop folder. Just wanting to make sure this change (which I'm totally in favor of, don't get me wrong) doesn't break or have unwanted side-effects. progwolff updated the diff for D11064: add preview images to fonts kcm. progwolff updated the diff for D11289: checkable FormLayout items. progwolff planned changes to D11289: checkable FormLayout items. can you provide screenshots as well t see how does it look? progwolff updated the test plan for D11289: checkable FormLayout items. progwolff added a comment to D10251: [RFC] Use mipmap filtering in window thumbnails. I tested it with several running applications, including windows with different apect ratios and combined previews for multiple instances of the same application. Looks great in every case. Could you please rebase on current master? progwolff added a watcher for KUserFeedback: progwolff. progwolff added a comment to D11308: Use the default Plasma wallpaper on the lock screen. @hein might be right here. If it's the single-click/double-click thing or this issue here: People who are happy with the status quo won't reach out to us. Maybe we need to discuss at a different place if and how we can learn about the opinion of the majority of KDE/Plasma users, before we change things that are possibly only broken for few. progwolff added a comment to D11316: Components for Cards. Marked some typos. Note that I am not a native speaker, so please re-check them. progwolff updated the summary of D11289: checkable FormLayout items. progwolff requested review of D11289: checkable FormLayout items. progwolff added a comment to D11064: add preview images to fonts kcm. I tried to unclutter the old kcm / new advanced mode a bit. progwolff added a comment to D11180: Reverse tooltip colors for Breeze colorscheme. I remember that the dark tooltips felt strange to me when I started using breeze. Now that I am used to it, I actually prefer the dark tooltips because of their high contrast to the other GUI elements. progwolff committed R875:d708fea839d8: Use selected text in searchToolBar (authored by progwolff). progwolff closed D11210: Use selected text in searchToolBar. progwolff updated the diff for D11210: Use selected text in searchToolBar. progwolff requested review of D11210: Use selected text in searchToolBar. progwolff committed R119:ac5c39292836: fix detecting changes in sub-pixel and hinting settings (authored by progwolff). progwolff closed D11174: fix detecting changes in sub-pixel and hinting settings. progwolff accepted D11118: Show a message if Konsole part is not installed. progwolff added a comment to D11118: Show a message if Konsole part is not installed. I really like that install button. Maybe it could be added to KWidgetsAddons? I see usecases in Okular for installing backends or in Telepathy for installing plugins. progwolff updated the summary of D11174: fix detecting changes in sub-pixel and hinting settings.